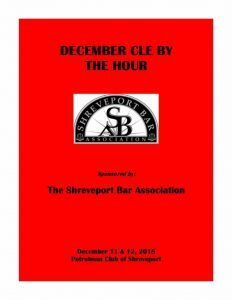 Welcome and thank you for choosing the 2018 December CLE by the Hour seminar for your continuing legal education. There is a spectacular lineup of courses and speakers that will make this seminar the best ever. Below are the links to the materials for both Tuesday and Wednesday. For your convenience, please immediately open and save this information to the device you plan to use during the seminar (laptop or tablet) OR you can open the links and print hard copies for your personal use. 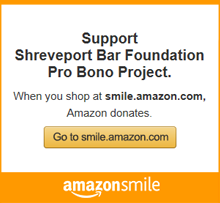 If you choose to print the materials, be aware the entire catalog is approximately 300 pages. We ask that you address this information before the seminar because the seminar venue does not guarantee sufficient bandwidth for you to attempt this at the seminar site and there is no guarantee printed materials will be available to patrons who chose the link option. 2. OPEN AND SAVE TO YOUR DEVICE THAT YOU PLAN TO BRING AND VIEW THEM FROM. THE PETROLEUM CLUB’S WI-FI BANDWIDTH IS SLOW AND COULD MAKE IT DIFFICULT TO OPEN THE LINKS ONSITE.